The E.P.A. is comprised of members who care deeply about the pond. Great day at the 2nd annual Snow Fest! Hi, my name is Mark Tibbetts, the Safety Chair for the Embden Pond Association. 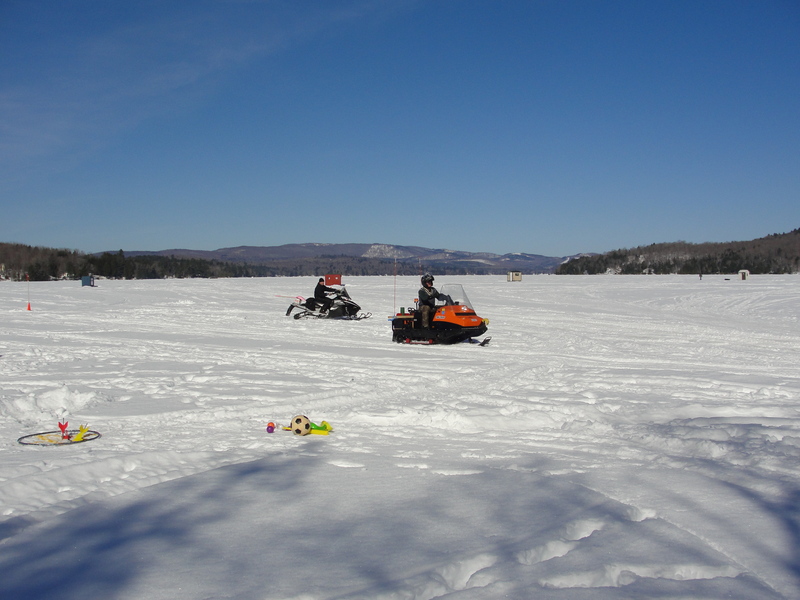 I coordinate with the Maine Bureau of Parks and Lands agency to maintain the placement and integrity of the navigational buoys located on Embden Pond. For those not be familiar with the buoy markings, all of the 22 Embden Pond buoys fall within one of two categories. The first is a buoy marked with black and white vertical stripes: these identify obstructions, which extend from the nearest shore to the buoy and indicate to a watercraft operator not to navigate between the buoy and the nearest shore. The second type of buoy is marked with a vertical open-faced diamond, which means DANGER. The nature of the danger may be indicated by words in black block letters above, below or beside the symbol in the white background. Some examples of the words used are: “Hazard Area,” “Shallow Area,” “Rock”, or “Water Intake”. So, if operating near any of these buoys, use caution and enjoy a summer of safe boating! 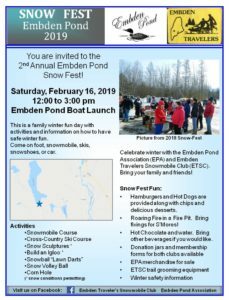 The first annual Snow-Fest at the boat launch was sponsored by the Embden Pond Association and The Embden Travelers Snowmobile Club. We gained memberships and met new faces. A letter from Ellen Hinman: There is no way that I can thank you enough for the beautiful bench. 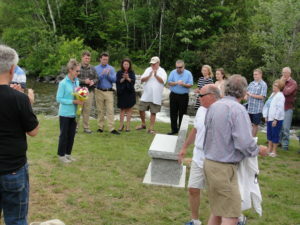 Dedicating it to Henry was such an honor on a beautiful summer day on Embden Pond. The bench is so nice with simple lines and a float plane. What could be better than that? We all love and cherish Embden Pond but nobody more than Henry. We bought our camp in 1970. Before long Henry was talking about lessons for float flying. Off he went to Greenville for a lesson and the rest is history. The plane arrived at our dock the next week! Most importantly though, is our love for Embden Pond and all that it means to us. Our children grew up at the pond. We celebrated brithdays, graduations, and even had one wedding. Our grandson Jack, who turned 16, this summer has never had a birthday anywhere else. 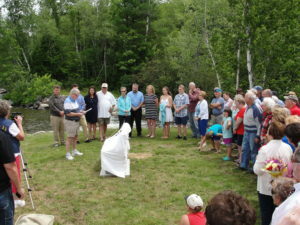 The Embden Pond Association has a big job taking care of the pond. Times change, boats and water toys make bigger and bigger wakes that eat at our shores. Some water plants arrive uninvited and the population grows. 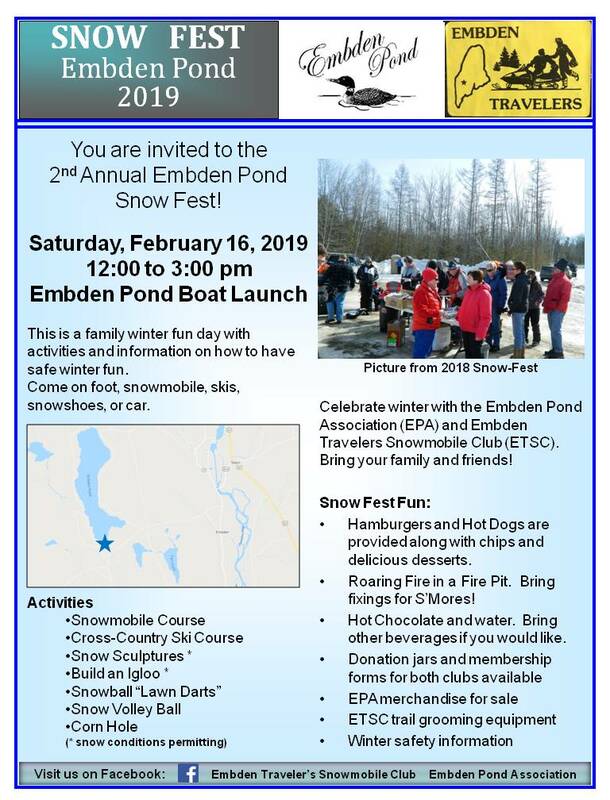 It is so reassuring to know that the Embden Pond Association is caring for the lake in all ways. 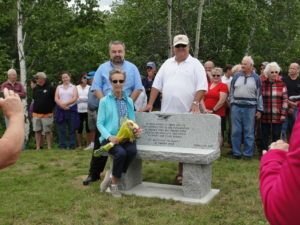 Thank you, thank you, thank you for the bench and what it means to all of us who love Embden Pond. The dedication of the granite bench in honor of Henry and Ellen Hinman. Mr. Roullard made the dedication remarks. 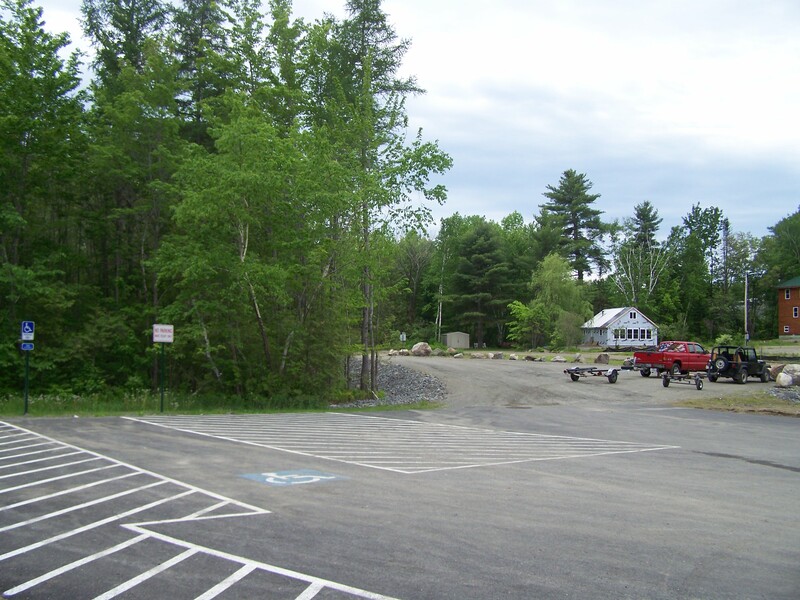 EMBDEN POND BOAT LAUNCH: There is a launch area and a separate parking area; both vastly improved. 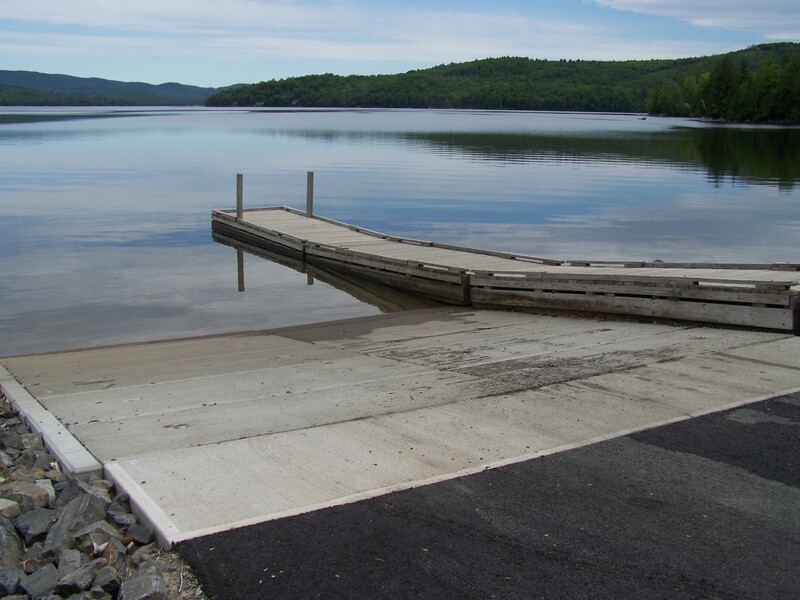 You enter from the left around the parking area, launch your boat and equip it, and then park your vehicle with trailer in the parking area. At this point you do not need a sticker to use this area. Please check your craft for any plant life and remove it if found. Help us prevent invasive plants from being introduced into the lake. Trash is carry in – carry out. The E.P.A. provides a seasonal restroom for the public’s use. THE SHALLOW MARKER BUOYS WILL STAY IN THE LAKE EACH YEAR THROUGHOUT THE WINTER. 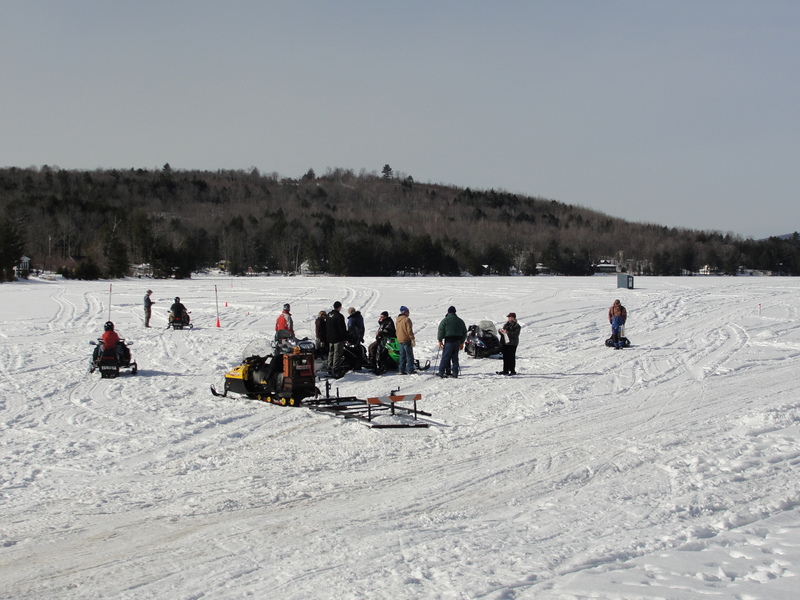 PLEASE BE AWARE OF THIS AND DRIVE SNOWMOBILES WITH CAUTION. For your safety, there is no swimming in or around the dock area. Swimmers are welcome at the public access point found near the exit area of the boat launch. Follow the trail to the beach.